When my cousin Krysia and I first started searching for our Jewish roots, we barely knew where to start. Our Aunt Pat, a genealogist, had shared an impressive record of names, places, and even stories. Obsessive Internet searches yielded limited results–things like a notice in the Canadian Jewish Review from October 1963 that listed my grandmother’s sister Maria Weglinska among the out-of-town guests at Rochelle Pifko’s bat mitzvah in Toronto. Pifko/Piwko was my grandmother and her sister’s maiden name. But how were they related to these Canadian Pifkos? Notice in the Canadian Jewish Review on October 18, 1963 about Rochelle Pifko’s bat mitzvah. How could we push beyond these tidbits? What more could we learn about our family? Thanks to the Jewish Historical Institute (JHI, Żydowski Instytut Historyczny) in Warsaw we made some breakthroughs that have helped us piece together our family tree. Krysia’s husband Steve stopped in during a business trip to Warsaw and met Anna Przybyszewska-Drozd at the genealogical division of the JHI. She did a preliminary search on JewishGen, and found references to vital records of some of our ancestors. A few months later, Krysia and I went on our first roots trip to Poland. We still had no idea what we were doing so we stopped in at the JHI, meeting with Anna’s associate Aleksandra (Ola) Dybkowska-Grefkowicz who stayed after hours to help us with our search. She prefaced everything with her usual caution, “Don’t be disappointed if you don’t find anything” because so many records were destroyed and most Holocaust deaths were not recorded. Then, she showed us how to make use of the records in JewishGen and the databases of the Polish National Archives, and suggested other places we could search for records. I learned enough at that meeting to make some breakthroughs. I discovered my Zurich cousins through the Family Finder database on JewishGen, and shortly after my Israeli cousins through myHeritage. On successive trips to Warsaw, Anna and Ola helped me learn more about my grandfather Jakob Rotblit. I was speaking with Ola about his automobile dealership in Gdansk when Anna walked in. 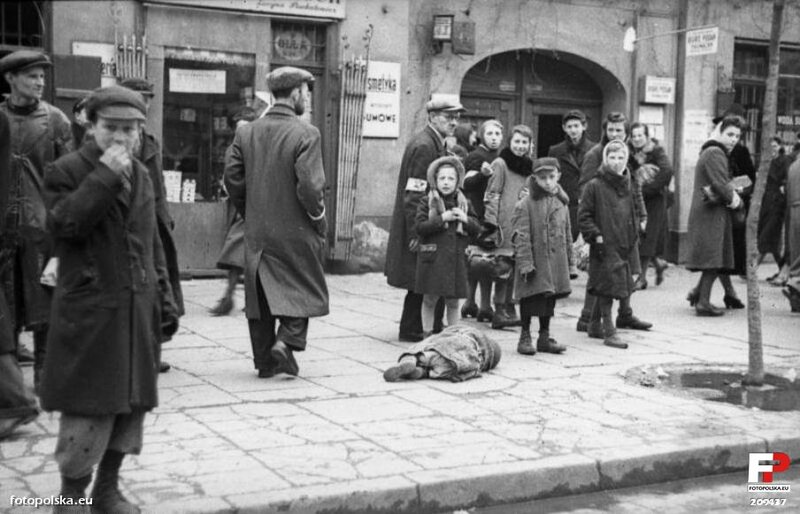 A look of recognition flashed across her face; she pulled a book off the shelf about Jewish business owners in Gdansk between the World Wars. Sure enough, Jakob Rotblit was listed with information about his Ford dealership and with details about his wife and his parents. Another time, I mentioned that my mother and grandmother are on the list of Jewish survivors who registered after World War II ended. With a satisfied smile, Ola told me that the original registration cards are in the JHI archive. I walked upstairs to the archive and was able to hold those cards in my hand. The archivist showed me how the earliest records, from 1945, were handwritten on the backs of cut up prewar accounting records. Paper was scarce, so they used what they could find. By 1946, information was filled in on larger, pre-printed cards made especially for this purpose. Once again, just a few months ago, the genealogical division helped me with my search. Anna e-mailed me that a woman, Ellen, had contacted her to find out about her Piwko ancestors. Anna thought we were related and asked if she could share my contact information with her. Of course I agreed, and since then Ellen and I have been in ongoing communication. She is an avid genealogist who turns out to be my 3rd cousin. Her great grandfather was my great grandfather Hiel Majer Piwko’s younger brother Urish. I knew nothing about him, maybe in part because he moved to Canada in the 1880s. Ellen and I had the extraordinary good fortune to be in Poland at the same time this June. She was on a once in a lifetime Jewish history tour of Eastern Europe with Professor Stephen Berk. Although I didn’t know anything about her or her great grandfather, I had an inkling about her branch of the family from that notice I found years ago about my Auntie Nunia’s (Maria Weglinska) visit to Toronto in 1963. Rochelle Pifko, the girl whose bat mitzvah she attended, was Ellen’s cousin and another descendent of Urish. So another mystery is solved. Some contact was maintained between my great aunt and her uncle who migrated to Canada shortly after she was born. And when Nunia/Maria came to the US in the 1950s, she renewed that connection and even visited. Ellen remembers when Nunia came to Canada some years later for another family event. The danger of digging up family skeletons is that you never know what kind of bones you’ll find. My mom rarely said anything about her biological father. In fact, it wasn’t until I was a teenager that she told me the man she called Papa, the husband of her mother, was not her birth father. As children, she and her older brother felt like orphans. They never saw their birth father, which I’m sure was related to the fact that talking about him would have revealed the family’s secret Jewish roots. Back then, in prewar Poland, Catholics did not divorce and remarry. When she finally opened up to me about him, Mama said she barely knew her father. She almost never saw him. Then one summer, following a big fight between him and her mother, Babcia (my grandmother) got fed up and told him, “If you want your children you can have them.” She put George (who was 15 at the time) and my mother (who was 13) onto a train to Gdansk, where they joined their father with his second wife and their daughter. The Baltic Coast was beautiful, but Mama was miserable. Her father didn’t know what to do with them, and his 2nd wife didn’t want them there; perhaps she felt threatened. After two months (that’s what I remember mom said, though some relatives have told me it’s inconceivable Babcia would have left her children for that long), my grandmother came to Gdansk and with effusive tears and passionate apologies, she brought them back with her to Warsaw. That’s the last time Mama saw her father. She told me she did not know what happened to him, but that probably he died during the war. She never told me his name. One of the stories my mother would tell me from time to time was about the “high button shoes” her father insisted she wear when she was around 13 years old. The bitterness still lingered when she described to me how much she hated those boots; they were old fashioned and ugly, the kind that were commonly worn in the 19th century. Her father contended they were sturdy, and proper for a young girl. They were also expensive because he’d had them custom made for her. I always assumed this was a conflict Mama had with Papa, her stepfather. It’s only now, as I piece together the fragments, it occurs to me this argument might have been with her biological father. The timing fits. Also I imagine he was probably the more conservative of the two. I only learned my biological grandfather’s name in 2011, when my Aunt Pat (the wife of my mother’s younger brother Sig) showed me a family tree she had made identifying my grandfather as Jacob Rotblit (in a previous post, I’ve written about how names can vary), son of Ignacy and Hanna, and brother of Maurice and Helena. Pat reiterated another fact my mother had mentioned: Jacob was from Warsaw but had moved to the Baltic Coast. Pat also had notes, presumably from conversations with my grandmother’s sister, that Rotblit had been a merchant who sold fine jewelry and luxury cars. Then my cousin Krysia remembered that before he died, her father (my mother’s brother George) gave her a photo of his father. Krysia wrote some notes on the back of the photo: “He was a respected Jew. Babcia fell in love with his friend Zygmunt and left him.” Then, with a rectangle around it was the name “Jakup Rotblit” and under that “my father’s father” and a roughly sketched family tree. So not only could I attach a name to my mysterious grandfather. I also had a photograph. And yes, his children resemble him. And so does one of my brothers and a cousin. From here, the trail went cold. It took another two years before Krysia and I obtained a copy of a birth certificate of a Jacob Rotblit who was born in Warsaw in 1891. The name, city, and date were plausible, but we didn’t know if this was our grandfather, our Jacob Rotblit or some other one. Though not a common name, I have found prewar records of at least three. This was in 2013, a time when Krysia and I would stay up until early morning searching everything we could think of on Google, and sending tidbits back and forth to try and fill out the story of our grandfather . She contacted several Rotblits she found to inquire if we might be related. I dug up references to Jacob Rotblit’s Ford dealership. This business, car sales, corresponded with my aunt’s notes. Granted, neither now nor then were Fords “luxury cars,” but in the 1930s any car was a luxury. 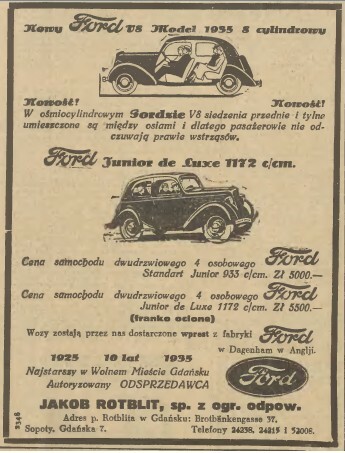 On November 20, 1936, a company was registered in Gdynia named “Permanent Automobile Market (Stałe Targi Samochodowe).” It was the initiative of the married couple Jakub and Bronisława Rotblit. The object of the enterprise Stałe Targi Samochodowe was the management of the trade in domestic and international products, specifically mechanized vehicles (new and used) as well as their accessories. In addition, the company offered parts, service, and repairs of vehicles. 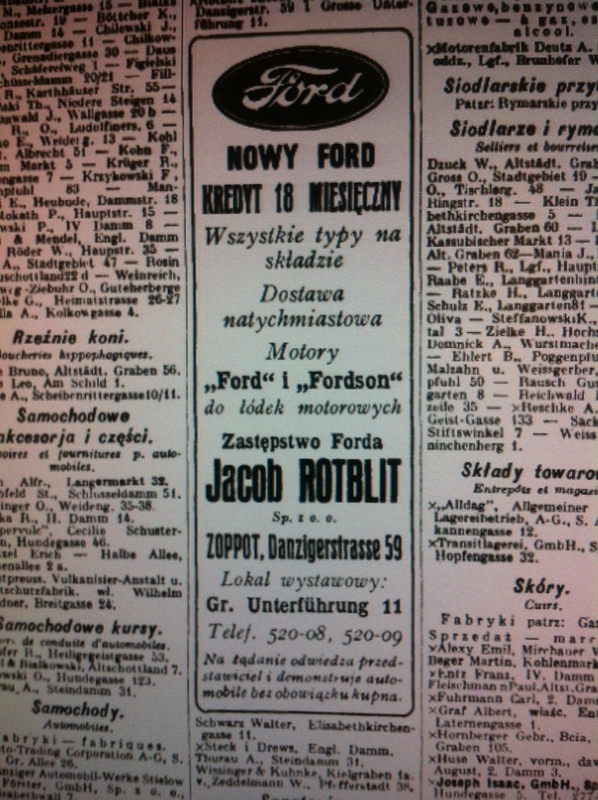 Jakub Rotblit specialized in the sale of automobiles and accessories of the Ford firm, of which he was an authorized dealer. The specific headquarters of the Rotblit’s company were always located in places beneficial to the interests of the place—first in the BGK building (at #31 10 Lutego [Tenth of February] Street), and from July 1938 in the new office building of the firm “Bananas” (at #24 Kwiatkowskiego Street). The operation of the firm ended suddenly upon the death of Bronisława Rotblit, as a result of which her husband moved to Warsaw. In the footnote: Jakub Rotblit (born June 25, 1891 in Warsaw), son of Arkadiusz Rotblit and Racheli Prowizor, married, merchant. Arrived in Gdynia from Warsaw June 25 1935. 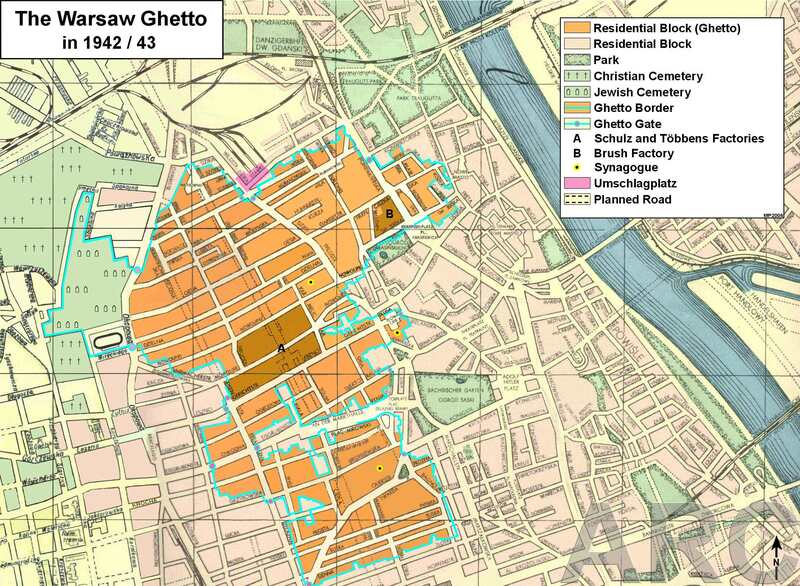 He lived at 25/7 10 Lutego Street and 6 Hetmańskiej Street. It took another year before I got the birth certificate (which was in Russian) translated and could confirm the vital information was consistent with what was written in this book: The birthdate was the same; the parent’s names were similar enough to likely be Hebrew and Polish versions of the same names (Aron/Arkadiusz and Ruchla/Racheli Prowizor). In my Aunt Pat’s notes, Jacob’s second wife was “Blanka” and their daughter’s name “Rosa.” I still couldn’t be sure, but it was looking more likely I had uncovered more traces of my biological grandfather. I have continued to collect fragments, fleeting references to Jacob Rotblit, never sure if they’re about my grandfather or not. Did his 2nd wife really commit suicide? Was he really arrested for business fraud? Was he shot outside of Warsaw in 1941 by a German officer? I have documents saying these things happened, but I have no way of checking these details and no way of linking them conclusively to my grandfather. But I have recently learned something truly extraordinary. Last month I was contacted by someone through Ancestry’s DNA matches. Genetically, we appear to be second cousins. And yes. His mother was a Rotblit, daughter of Louis/Leib Rotblit who came from Russia/Poland. Louis arrived in England, married and had three children around the time of World War I. My cousin knows very little about his grandfather because he left his grandmother after several years. His mother never talked about him. But on his grandparent’s marriage certificate, Louis’ father was named Aaron and his brothers Moshe and Ya’akov (all written in Hebrew, so the English or Polish forms could easily be Arkadiusz, Maurice (? ), and Jacob). Enough of these details add up. And DNA is likely to be the most concrete evidence I’ll ever find. Another branch of my family tree is filling out. More relatives survived.